Fire crews from around Summit County are breathing a little easier this week after some much needed rainfall this weekend helped to douse the Buffalo Fire. 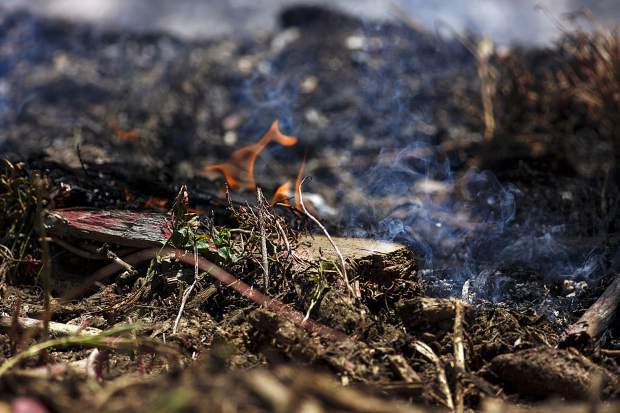 The county downgraded the fire danger to moderate on Monday, signaling a respite in the early weeks of wildfire season. But officials warn that the interlude may be short lived. “Hurricane Bud is our bud,” said Steve Lipsher, community resource officer for Summit Fire & EMS. “It was the remnants of that pacific hurricane that washed ashore and gave us that really wonderful rain this weekend. It not only directly helped out on cooling any remaining hot spots, but also gave us a good shot in the arm. For now, however, things are moving in the right direction thanks to about half an inch of rain Sunday evening. The fire remains at 95 percent containment, and hasn’t grown from 81 acres. The regional Type 3 Incident Management Team in town to assist was relieved on Sunday morning, and management transitioned over to a local Type 4 team. There are currently 25 firefighters still working the scene, most part of a crew out of Oregon along with personnel from the Colorado River Interagency Fire Management Unit, said District Ranger Bill Jackson. Jackson noted that there would likely be visible smoke coming from the area over the next few days, but that residents don’t need to be alarmed. More concerning for fire officials is the number of trespassers entering the burn area. Jackson said that there’s still an 81-acre area closed to the public for safety reasons, but that they’ve seen a number of people enter the site wanting to look around. Jackson warned that the area is still very dangerous with fire-weakened trees, stump holes and remaining hot spots. Jackson said the Summit County Sheriff’s Office would be patrolling the perimeter of the burn area to search for trespassers and keep them out. The investigation into the origin of the fire has also already begun, and is being led by law enforcement officers from the Forest Service in cooperation with the sheriff’s office. Jackson said lightning data pulled over the last 30 days came up negative, and that the fire was likely human caused, though no trigger mechanism has been identified. Investigators will try to identify the burn pattern by finding the point of origin, and searching for forensic and physical evidence like trash or accelerants. But the process can be difficult, especially with larger fires. The Peak 2 Fire, an 84-acre blaze that broke out south of Frisco last July, was also human caused. But despite an ongoing investigation and a dedicated tip hotline, neither a definitive cause or even a person of interest in the case has been identified, according to Jackson.